In comparison to other more serious skin problems skin blackheads may seem a minor and inconsequential problem to worry about. However, blackheads can pose a problematic day to day living for individuals that are prone to getting them. Like many other skin problems, blackheads can also affect an individual’s perception of themselves; their self-confidence and esteem. ‘Open comedomes’ is the scientific term for blackheads. They occur due to skin exposure to different aspects of life. At Clear Medical we not only aim to clear these widened pores, but also minimise their recurrence for a clearer skin. 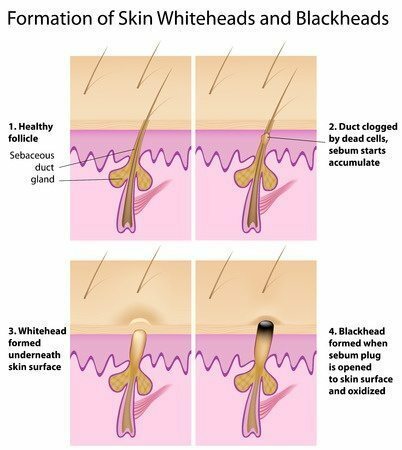 Blackheads mainly occur in hair follicle pores which are occluded with sebum (oily matter secreted by the sebaceous gland) and keratin (fibrous protein). The sebaceous gland secretions can be induced by skin abrasion or your immune system response to internal stress. Research conducted on blackheads shows that there are inherent susceptibilities to open comedomes. This also means that they can affect any ethnicity and appear over any area of the body. The black appearance is caused when the open comedomes become clogged with dead cell or environmental particles followed by the oxidation of sebum and keratin. Favre-Racouchot disease is more severe solar elastosis (the accumulation of abnormal elastic tissue with in the dermis of the skin) within open comedones, studding the periorbital (inflammation of the eyelid and the skin around the eye) region of the face. Skin blackheads are quite common over the nasal area and most people attempt to remove them with cleansing nose strips. We do not recommend using pore strips for blackhead treatment as it is similar to waxing. Removing them with this method may cause irritation and damage to the skin. Over time it may also cause the sebaceous gland secretions to increase causing the situation to become more prevalent. The pore size may also dilate further causing an increased number of blackheads. We welcome you to come and see us for a completely free of charge consultation. Of course you aren’t under obligation to undertake any treatments. We are here to help and advise; not sell. During the consultation we assess your skin, treatment explanation is given fully and if there are no medical contraindications, we can arrange an appointment. Treatment intervals can vary depending on various factors; these include the treatment area and the severity of your skin blackheads. The number of treatments needed can also vary depending on an individual’s ethnicity, immune system, stress levels, internal and external biological environments, and your skincare between each treatment. We will keep you fully informed throughout the treatment process and will discuss with you our expectations on how long the treatment may be necessary. We are proud to uniquely provide Skin Treatment Pricing per cm². Due to this, we can ensure that at Clear Medical the skin treatment pricing is concise, consistent and fair. Clear Medical carries out blackhead treatment with care, knowledge and experience and always with the client’s best interests in mind. Our clients always positively comment on the quality of the treatments they receive. Our guidance or blackhead treatment, can either reduce, eradicate or prevent blackheads from being an issue. We want you to be able to have the time to enjoy life without the worry of regular blackheads and skin irritation. Clear Medical provides a clean, relaxing and friendly environment which gives you the perfect setting for advice, care and treatment. Also, we retail a Cellulose Fibre Scrub Mitt from our online shop. The glove fabric is plant fibre, which naturally helps prevent and reduce blackhead appearance. This complements our blackhead treatment and can help enhance the condition of your skin. Therefore, combining gradual exfoliation with your regular skin care regime ensures optimal skin health.